Protecting your business name is a priority for any new business. Protecting your business name is a priority for any new business. Learn what steps to take to protect your business name & when is the optimal time to register your business name as a Trademark. 1) Is anyone already using the name? businesses could have the same trademark if they are selling completely different products or services. 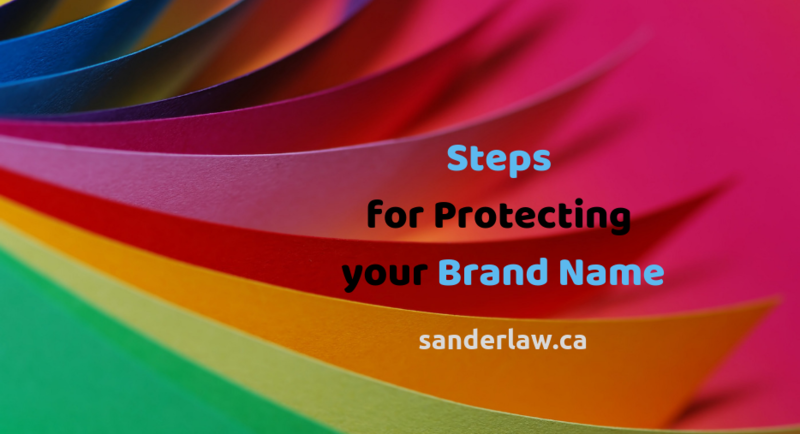 Although you may wish to conduct your initial name search on your own, Sander Law can provide you with a more comprehensive search for your trademark to determine its availability. A comprehensive search will include a search of the Canadian trademark database for pending & registered trademarks that are the same as your proposed trademark, or very similar. As well, it will search your trademark against business and corporation names & domain names. Once you've cleared your chosen business name, its now time to secure your domains & social media handles. You want to do this before you file a trademark application. Once you file a trademark application, information regarding your trademark is publicly available in the Canadian Trademark database. Some entities monitor this database & will scoop up domains & social media handles relating filed trademarks, in hopes of selling these to the trademark owner at a profit. A registered trademark gives you exclusive rights in the trademark across Canada for 15 years, as well as additional benefits. Contact Sander Law to prepare & file your Canadian trademark application. As a Lawyer & Registered Trademark Agent, I can ensure your application is filed correctly & I will monitor your application & related deadlines all the way through to registration. Your trademark application will be filed quickly, typically within 1 to 2 days after receiving all necessary application information. Read more about the benefits of hiring a Trademark Agent. Depending on your business structure (e.g. sole proprietorship, corporation) & depending where you are planning to do business (e.g. one province, across Canada), you need to register your business name with one or more provinces and/or federally. For example, as a sole proprietorship operating in Ontario under a business name other than your legal name, you would register your Business Name with the Ontario government. Note that a business name and/or corporation registration with the government does not give you 'trademark rights'. Learn why you need Trademark Registration to protect your brand. Contact Sander Law today to protect & register your important trademarks! The above content is for informational purposes only and is not legal or professional advice. Copyright © 2017-2019 SANDER LAW. All rights reserved.